All about the passion of making cycles and enjoying the green ride. 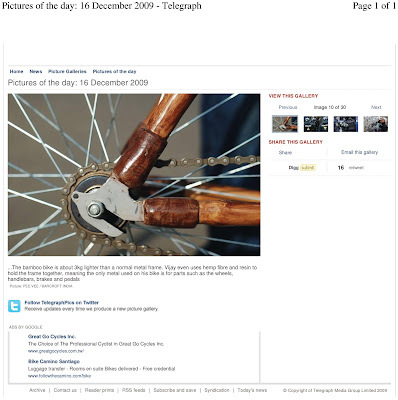 Italy based Mauro Vanoli is a Bike enthusiast who collects different types of bikes and bike related stories from around the world. Mauro came down to Bangalore to get himself a Cargo MTB made in Bamboo to his specifications + make a 10 minute documentary film on the Bambike. He spent about 2 weeks with me in my workshop. We went around the city buying bamboo and missing cycle parts which he left behind in Italy and several delays & retakes later the first Cargo Mountain Terrain Bambike made its debut. On one of our Sunday trips to the India coffee house, I bumped into Brigitte Kleine. 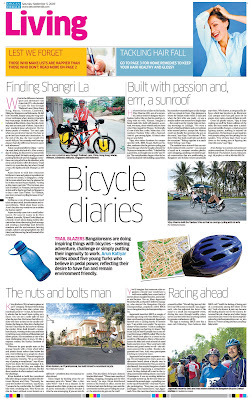 I had read an article about this 63 year old German lady traveling the world on her bicycle in the papers a couple of days back. I cross checked with Niya who also recognized her from the article. We immediately approached her and she was glad to meet someone who knew who she was. Unfortunately she didn’t understand a word of English (German was all she spoke) and couldn’t hear well too. However we began a broken conversation with her through sign language and sketches. I showed her the pictures of my Bamboo bike and she was excited to know I made it. We decided to meet again with a friend of mine who knew German and could translate. She did make it to my workshop a few days later and this time we could talk thanks to my friend Katherine, the translator. I showed her my trikes, bamboo bike etc and we learnt more about her trip which has taken her to 28 countries already in a span of 4 years. 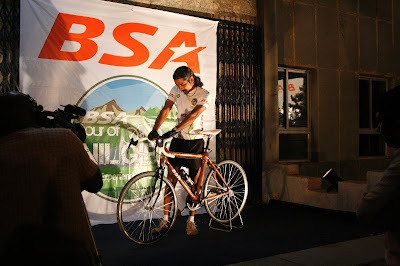 So far she has cycled through America, South America and South Asia and she will be on the road for the next 6 years. She had brought her bike along. Made out of Cro-moly and complete with hub gears, it was custom made and sponsored for her trip by a German bike manufacturing company - Patria. She loved my Bambike and wanted to promote it on her onwards travels. Later during the day she visited our house to see our terrace garden and some more bikes I had made. Since the translator friend could not accompany us then, we decided to use Google translator to communicate. We spent the entire afternoon conversing about her trip, her family and India among other things. She was very appalled to see the poverty and the divide between the rich and poor in India and was very curious to know how other countries can help India. She also shared with us some of her bad experiences on the trip like getting mugged and shot at in Honduras and getting pelted at with stones in Pondicherry! When we asked her if it was her choice to travel alone, she replied in affirmative saying she didn’t want her decisions on the trip to be influenced by any second person. The Bambike was put through a JIS (Japan intdustrial standard) testing at the factory of the TI Cycles - Chennai, wherein it undergoes vibration on the machine for 1,00,000 times. The Bambike successfully finished a count of 2,00,000 on the machine with the frame still completely intact. 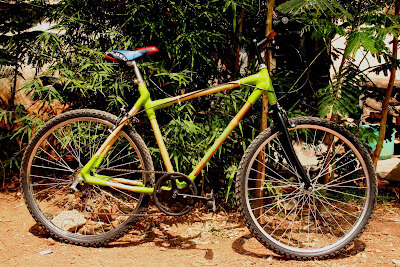 After my bikes and trikes were successfully running on the roads of Bangalore, a friend approached me with the idea of building a “Bamboo bicycle”. 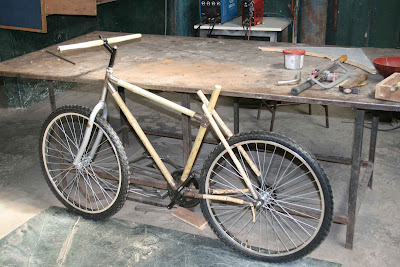 I thought I should give it a try and a few weeks later I felt happy as I finished assembling the bamboo bike in my terrace garden. 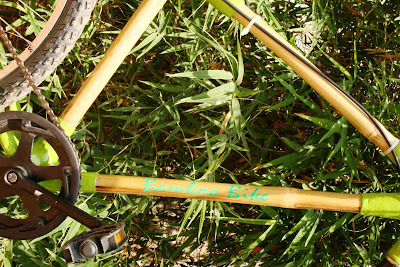 The bamboo bike is an environmentally friendly bike as it uses bamboo in place of steel for the main frame of the cycle. 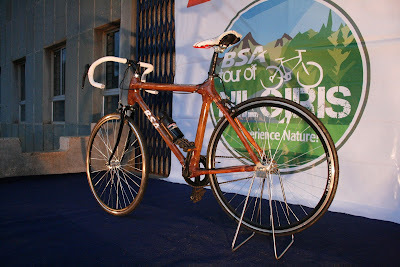 Therefore with each such bamboo bike one is cutting down the consumption of steel by 3.5 kgs. The first prototype was made with raw bamboo with metal sleeves on junctions, as I had not thought of a jig while making the frame (a jig is a metal frame used as a reference for mass production while joining different parts to make an object so that all the pieces are identical.) After testing it further, I realized it had a fish tale effect at higher speeds which had to be overcome. 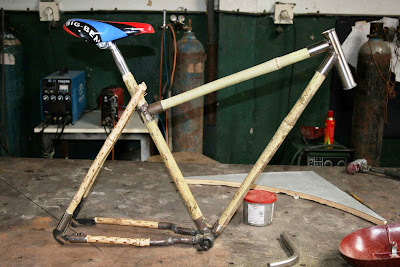 The second prototype was made using thicker bamboo sections and this time with a jig to hold all members and important junctions like bottom brackets, rear drop out, head tube and seat tube. This time around the parts were glued together without metal sleeves and using hemp fiber. 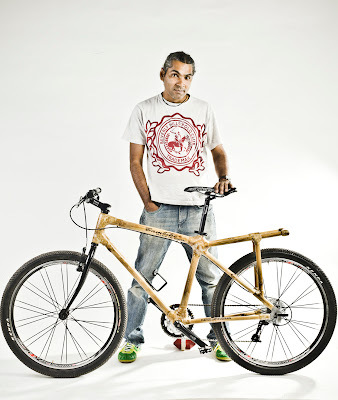 After I had finished making my first prototype of the Bamboo bike I met Arun Katiyar. 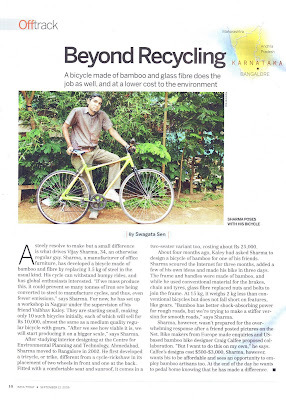 Arun is involved with the Ride-A-Cycle Foundation that promotes biking, going green – a small way to give back to the environment. He not only appreciated my work but was very instrumental in encouraging me to develop it further. While I made more prototypes later, he tested them out and gave me the relevant feedback to improvise on the designs. 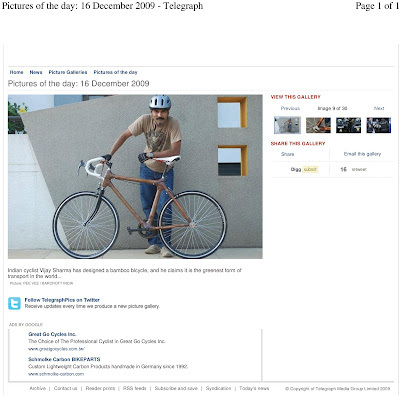 Later Arun suggested that I build one bike for Tour of Nilgiris (TFN) http://www.tourofnilgiris.com/blog09/. I loved the idea because TFN is one of the challenging mountain biking events, I thought it is a very good idea to put my bamboo bike through the endurance and get further endorsement. The Tandem was fun to do because it also allowed both Niyatee and me to take one bike out instead of taking our own individual bike. The maiden ride was from our home in Koramangala to Lal Baug on a bright Sunday morning with a bunch of our biker friends. Needless to say the tandem was a star attraction! Both Tandem and Trike have been a great hit with the children in the area where we live as well as when we take them out. The kids just didn't seem to have enough of the tandem. So much so, the parents have asked us to reward the children with a ride if they finish their school work. I have had children tell me that they would rather for-go watching television and ride the Trike or Tandem. It feels good to share a smile with the children and see them so excited.